We arrived at Monte Cielo Resort shortly after 9PM. Our gorgeous and gracious hostess, Ma'am Mayette Sy was so kind and so cordial in meeting us and show us our room. We're seven in the group, the 5 boys (that'll make them sound young, jeje) were billeted at the main house while Leah of 13thwitch.com and I were housed in a separate cottage. 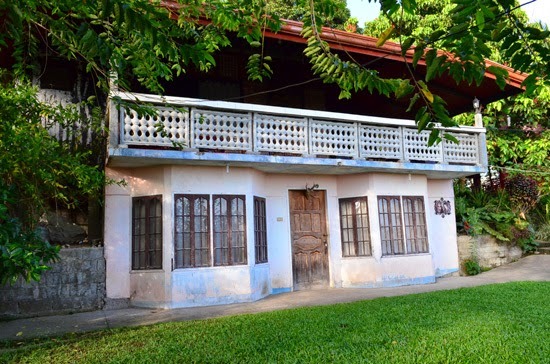 We were brought to a spacious and clean polished bamboo-walled room with a nice veranda. It has a clean bathroom with hot and cold shower. There's also an electric fan on the side but I figured there's no need for it or for an air-conditioner as temperature in Lake Sebu drops to 16 degrees Celsius during night time, so its impractical to operate such machines around here. Leah and I shared the firm-foamed (which I like so much) and daintily duveted matrimonial bed. The OC that I am went checking around the veranda for unusuals. Yeah, that city habit of mine before hitting the sack is quite hard to break. But I can't see a thing just light flicker from afar, soft sound of gushing water from below and the chirping crickets in the dark. Trusting Mayor Fungan's words that his town is safe and secure and knowing that we had a comfortable bed we decided to call it a night. We're beat. My body clock always ring at 5AM. Yeah, that routine you do when you have school children. Careful not to wake up Leah, I slowly went out of our glass-doored room to check our surroundings but it was still dark so I went back and waited. And when the first light of day came I went out again and what I saw made me remember this mountain resort forever. It's a multiple wow! The view is magnificent. 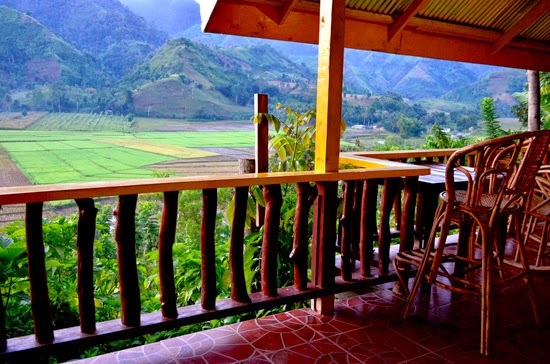 The veranda overlooks a valley of rice paddies with the verdant Talili mountain range at the background. The soft sound of gushing water I heard the night before was actually a clear river that rounds the foot of the hill where our cottage is standing. Then the soft ray of the morning sun seep through the mountain fog making it look like webs wrapping the trees from afar. It's spectacular! The kind of serene and relaxing picture you want to play in your mind when you're so full of the mundaneness of the city life, it's so invigorating! After our morning rituals, we met the boys at the main house. 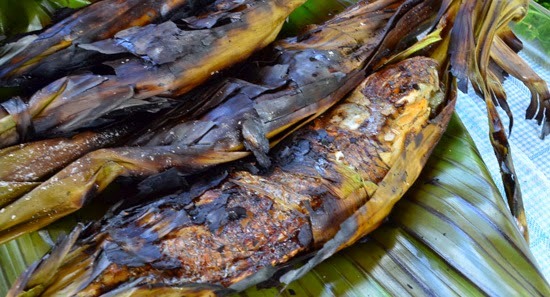 Our ever so kind and so full of life hostess, Ma'am Mayette, who also happens to be the President of Lake Sebu Eco-Tourism Council treated us to a pre-breakfast treat - Suman and Ibus, they're Illongo 'kakanin' and God knows its been ages that I haven't eaten this delicacy. Native coffee to pair it with is as always a pleasure to indulge, so good. 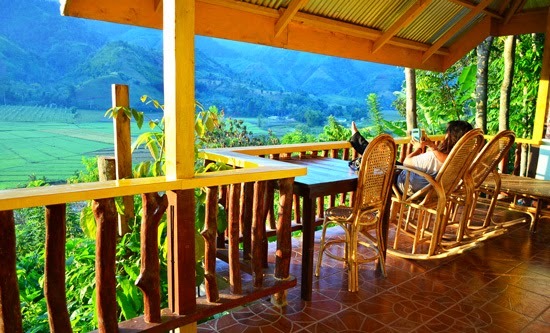 Monte Cielo Resort is perched on a mountain plateau. 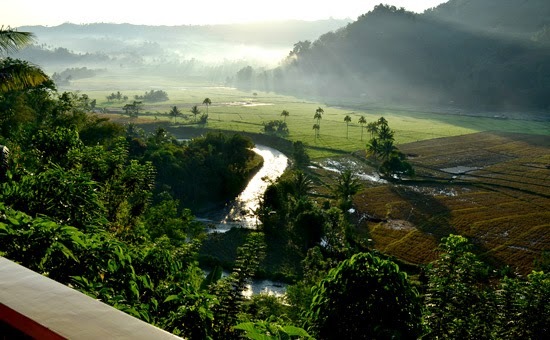 The east side overlooks a valley of rice paddies, where I just witnessed a spectacular mountain sunrise and the west side overlooks the serene and idyllic Lake Sebu. Your morning lake view from that veranda below, so calm. 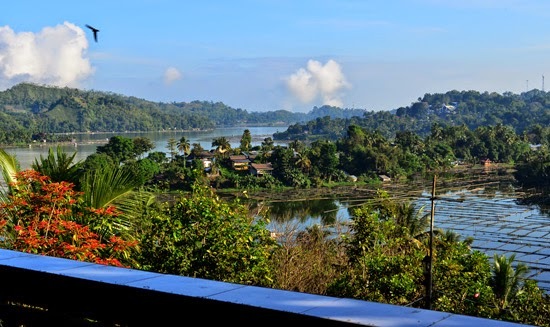 With its secluded and breathtaking location, Monte Cielo Resort is a perfect place for retreats, seminars, family vacation and I bet a garden wedding with a lake at the background can be very romantic. 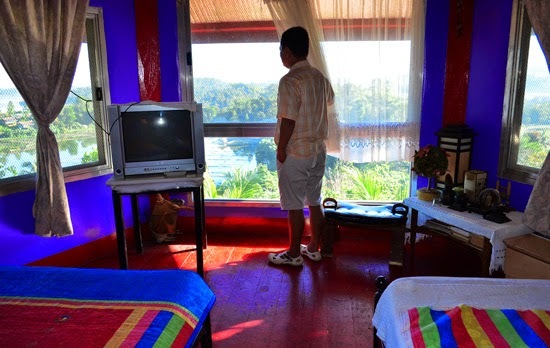 This red tower that overlooks the lake is called Bishop Orlando Quevedo Tower, it was named so as it was the good Bishop who was the first to sleep in this impressive and multihued suite. Penny for your thoughts, Sir Jon? 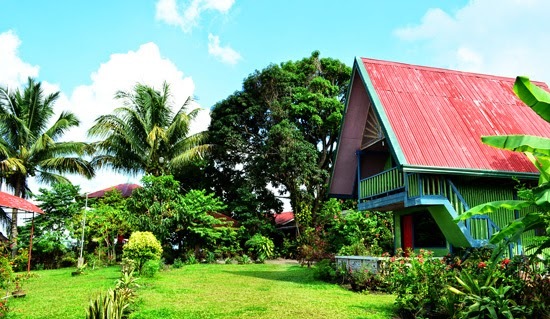 And this charming house looks so small from the outside but its surprisingly spacious and well-kept inside. 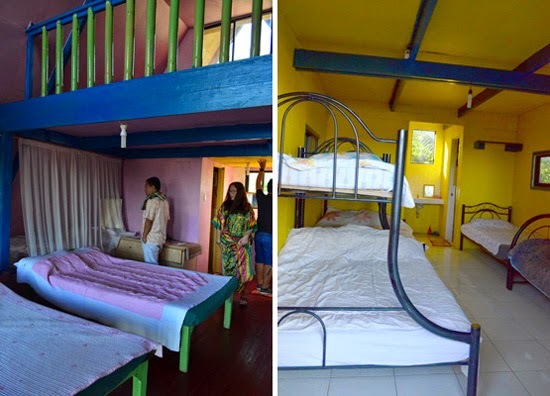 It can accommodate large groups and also ideal for family lodging. Monte Cielo Resort is a charming mountain haven that offers a picturesque sanctuary to purifying the mind, a tranquil haven for relaxation and a scenic retreat to indulging the luxury of breathing. And if this mountain top solitude isn't enough for you yet and you want more out of your stay to complete your 'communing with nature' experience, you can arrange with Sir William (Ma'am Mayette's better half. God, I really love this couple) a trek to Ispok's Haven. It's a hidden natural and unspoiled forest reserve with waterfalls and rolling river on the site. 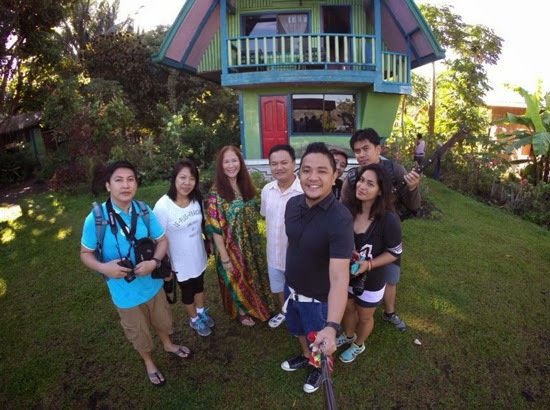 This side trip is open only to Monte Cielo Resort guests and we're privileged to take a trek here. Read more about our ISPOK'S HAVEN ADVENTURE here. Our Monte Cielo experience wouldn't be complete without trying their food. So after our morning T'daan Kini Falls trek (blog post up soon) we head back here for lunch. Trekking means starving, can't wait to eat. Apart from the spectacular mountain-lake scenery, warm hospitality and a very personalized service, Monte Cielo Resort also has delicious and mouth-watering comfort food to offer. Reliving my treasured experience while writing this post, it reminded me a lot of that Japanese Manga, Shinya Shokudo. It's a story about a man who opens his restaurant at midnight and his menu consist only of two choices but the good catch is, there is always this possibility of getting served anything else as long as it is possible. And I thought Monte Cielo Resort's very personalized service fall right in this philosophy. Very personal and they treat each of their guest very special. I love it. 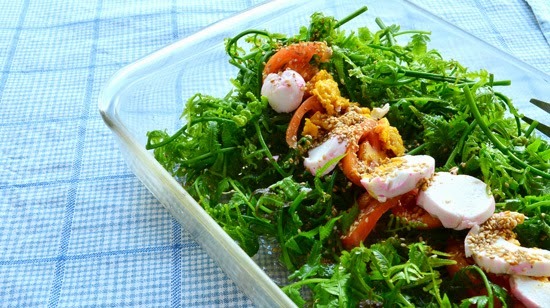 Pako (fern) Salad. This is so far the freshest pako salad I've ever had in a long time. While savoring the flavored stalks snap in my mouth, our travel buddy Bryan Uy of boylakwatsero.com was saying that, what we're eating were actually the same bunch of fern a T'boli girl was carrying we met on our way up to T'daan Kini Falls. It's interesting to know that such simple gesture of exchange had hit a bit of economy in the everydayness of the townfolks here. Hence, I encourage you to come to replicate the action. 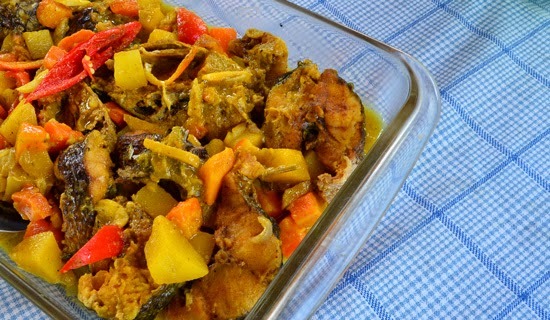 Ginataang Manok with Ubad ng Saging is an authentic Illongo specialty. 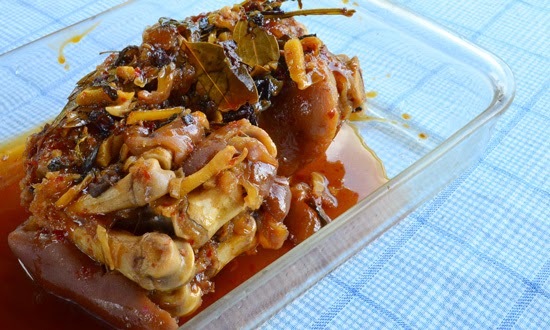 It's chicken done in coconut milk with 'ubad ng saging' (or the tender core of the upper trunk of a Saba banana) Having an Illonga mother and a farm girl myself, this delicacy has been a constant back when there was 'dagyaw' in our farm. 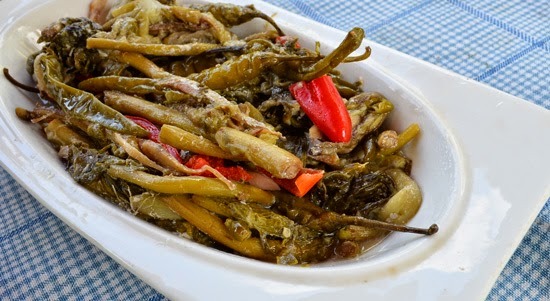 (An Illongo term for bayanihan) And God knows it's been so long that I haven't had this. It's comforting to travel down memory lane through food. And just as I expected - every bit of what's in the bowl suit everyone's taste perfectly and it got emptied long before we know it. So good! The Laing of all time, so good! bless the hands of those who cooked this, kanamit gid! 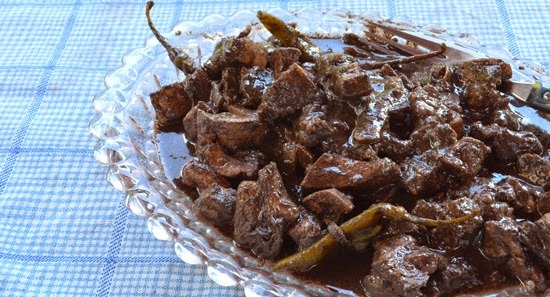 Oh, so meaty Dinuguan, love it! Monte Cielo Pata Tim. This slowly braised pork leg is another bomb. It's so tender, so rich and so thick in flavor. 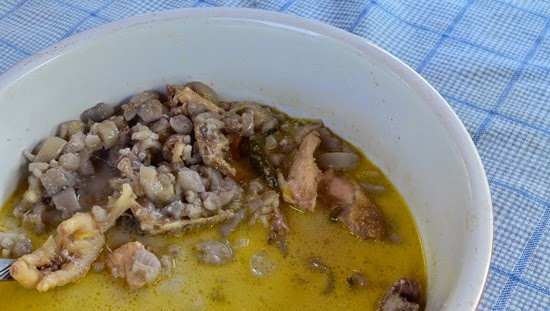 It's a kind of comfort dish you want to have after walking the mountain. Thought I've lost several calories on that T'daan Kini's mid-day trek, so I figured having extra rice with this tender Pata Tim wouldn't be a bad idea at all. It's a delicious excuse to indulge. So satisfying. Thank you so much Ma'am Mayette for the sumptuous and laughter-filled lunch. We enjoyed every morsel of food you've served us. Thank you too for the warm and renewing accommodation. Salamat gid! Thank you so much for the warm and delicious accommodation. Monte Cielo Resort does not accept walk-in guests, so please book in advance, here's the address and contact nos. Great photography AteV, again, the food makes me hungry right now! thank you Rose and just in case you have extra time when visiting Philippines next time, hope you can come down here, it's really a nice and peaceful place.